Last weekend, Mikey and I had the opportunity to pay a visit to the Ventura County Fair. It was my first time at the fair and I had no idea how big it was going to be. Even more importantly, I had no idea how much food they would have to offer. As it turns out, Mikey and I barely scratched the surface of what they had, before reaching our agreed upon calorie limit of 5000. The fair is right down by the beach, at Seaside Park. It’s gorgeous, right up until the time when you have to walk back to your car, downwind from that horrid sewage smell that sometimes wafts its way along the beach. Other than that, it’s the perfect location. Parking isn’t too bad and if you’re willing to park in the nearby structure and walk, you’ll get a little exercise before gorging yourself on all the great food. Obviously there is more to the fair than food. But food was our main reason for attending. They have tons of rides and carnival games, along with local vendors selling their wares. There are also several exhibition halls with everything from local flora to collections of Harry Potter memorabilia. Mikey and I spent 20 bucks each at the carnival and walked away with 3 stuffed animals and a sense of manly pride that only comes from showing a carny what’s what. But first and foremost we were there to eat. We didn’t really do too much sharing, instead opting to go head to head with our food choices. Round 1 was Mikey’s Tri-tip sandwich vs. my Cajun corndog. Mikey’s $9 sandwich was kinda disappointing. 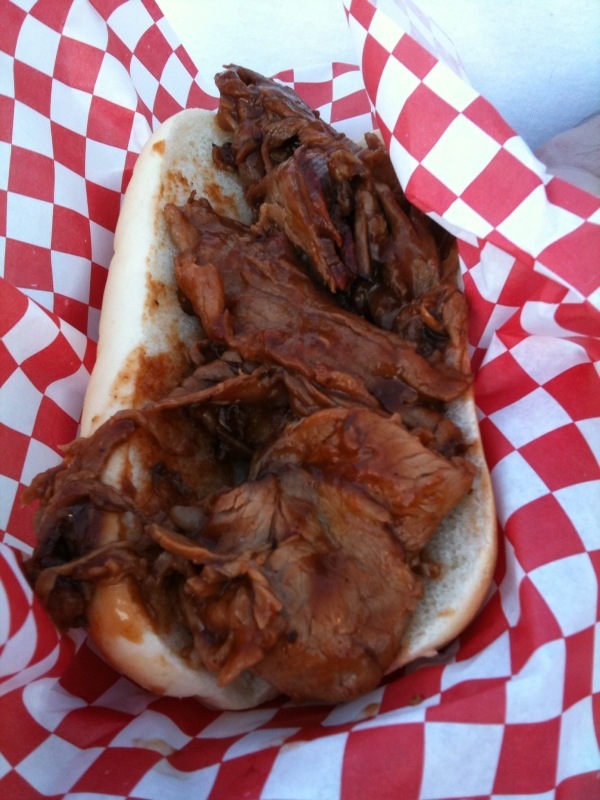 He confided that the tri-tip was too thin and fatty and wasn’t worth the price he paid. 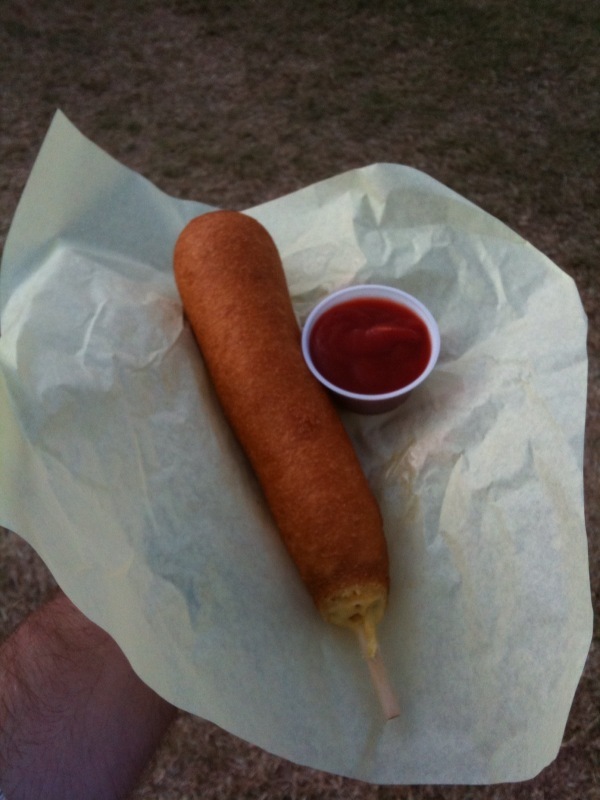 My $6 cajun corndog, on the other hand, was pretty damned good. It was about a foot long and the breading was awesome. The only minor complaint was that there was nothing cajun about the outside. The dog, itself, had a nice spice to it, but was overwhelmed at times by the outer shell. Overall, my corndog still took round one, besting Mike’s tri-tip by a mile. Next up was Mikey’s stuffed mushrooms vs. my Pink’s chili cheese dog with bacon. This battle was a lot closer than you might think. Not because of the taste of the food necessarily, but because the people at the shack selling the $4.50 stuffed mushrooms gave me the mother of all “that’s what she said” moments, when advising Mikey on how to carefully eat his mushrooms. Since we like to keep it clean here on EatMeCalifornia, I won’t go any further, other than to say that those Mushroom folks have an awesome sense of humor. 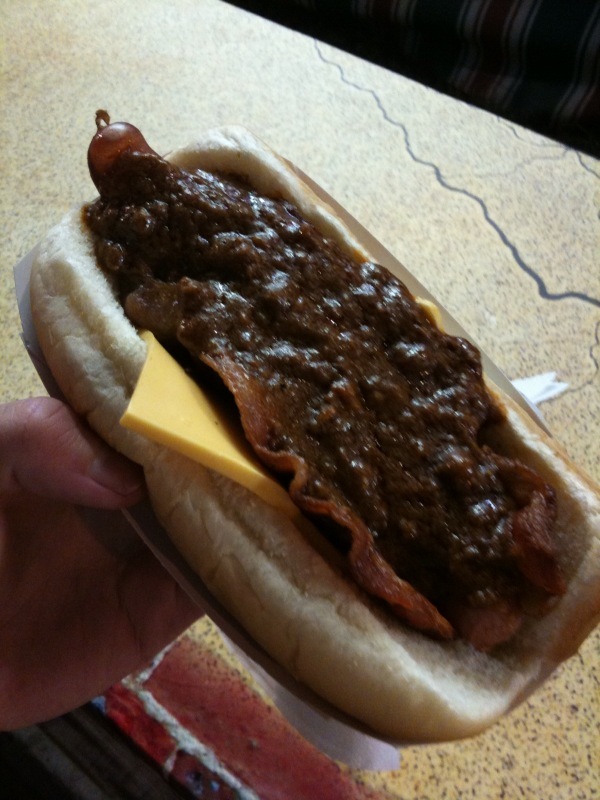 My $8 chili-cheese dog, with bacon, was pretty legit, even if the bacon was way overdone. Pink’s is an L.A. institution for good reason and their dogs are the stuff of legend, only falling to Nathan’s in terms of overall quality and history. Still, I had to give this round to Mikey and his magical mushrooms. We were now tied 1-1 going to the final round. 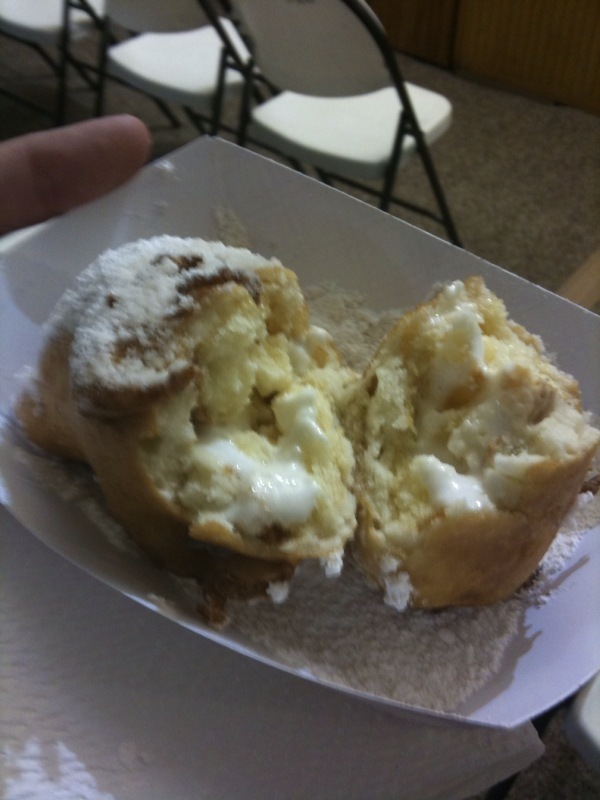 Our “snack” came in the form of a dozen mini donuts from a group of older ladies in the commercial expo building. These little delights are fried up on a little oil conveyer system which cooks them for just the right amount of time before depositing them into a sugar/cinnamon mixture and then bagged for your eating pleasure. At $4.50 per dozen, they were a great bargain. 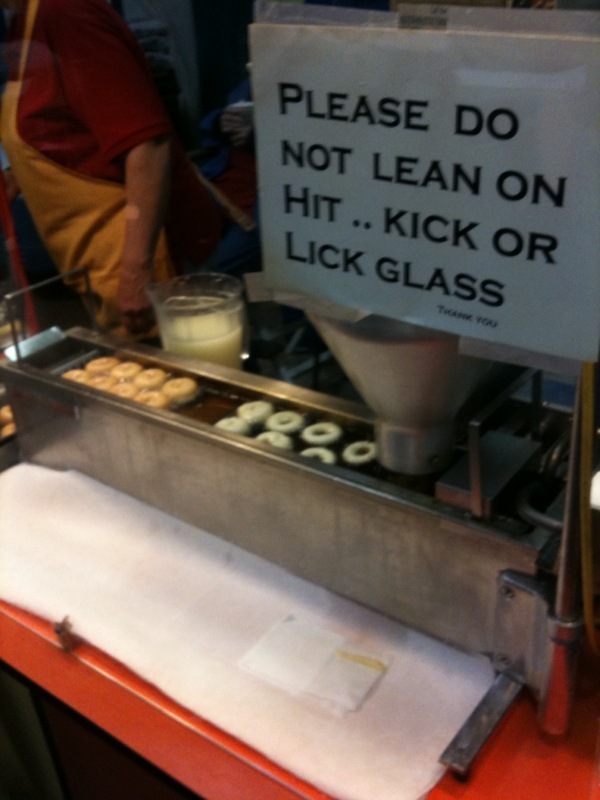 They melted in your mouth in a way that would make a Krispy Kreme donut blush. The Ventura County Fair runs through August 16th, so you still have plenty of time to get down there and share in the fun. Despite the fact that you’ve already missed Huey Lewis and the News (which has got to be heartbreaking), there are still plenty of great acts scheduled to play this week. Click here for the complete entertainment schedule. Hopefully you’ll get the chance to go to the fair and endanger your health like Mikey and I did. If you’ve already been, tell us about what you ate in the comments and if you still plan on going, hit us up after your visit. We’re sure that you’ll find some hidden gems that we missed, or at the very least, you can eat the funnel cake that we were too stuffed to cram into our bellies. Goodluck and godspeed. I am amazed that you gave this a good review. I can’t believe you didn’t get the chocolate covered bacon. That’s the only reason I’m going tomorrow. 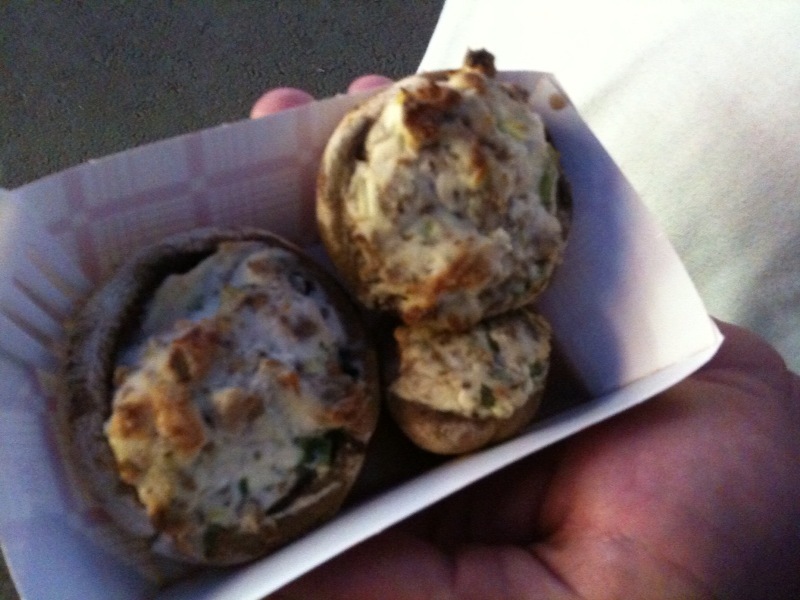 I had no idea they had stuffed mushrooms-if you had only told me sooner!